Will the heat wave in Israel determine the outcome of the Labor Party runoff? 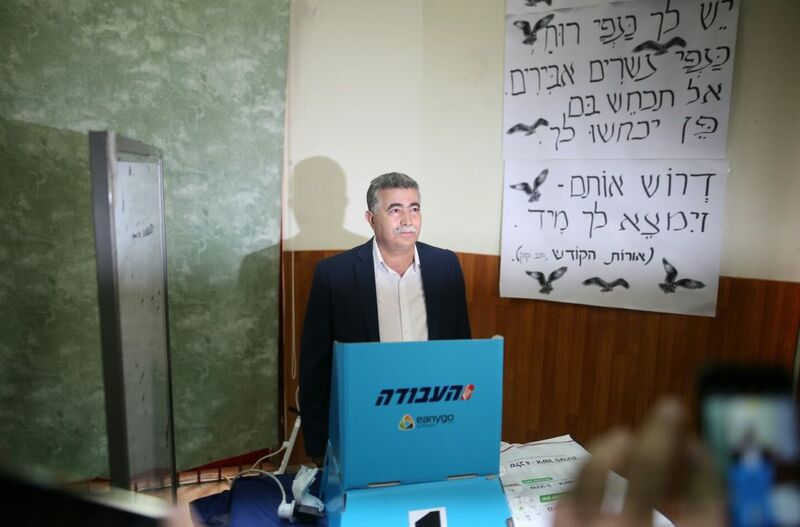 As Labor members go to the polls on Monday for a second round to determine who becomes party leader, it seems that the choice of 65-year-old Amir Peretz would mark less of a change for Labor. His success in the first round, for example (first place at 32.7 percent) wasn’t a surprise. Technically, he shouldn’t really be considered an outsider – his roots in the party run deep. But his revolving-door relationship with his political home means that even after decades of involvement the outsider label still applies. Peretz was born Armand Peretz in Boujad, Morocco, in 1952. His father owned a gas station and was the head of the Jewish community. When Morocco won independence from French colonial rule, the family immigrated to Israel and settled in the southern development town of Sderot, near the Gaza Strip, where his father was assigned to a factory and his mother was put to work in the nearby fields and at a laundromat. He was one of only two children from Sderot to study at a school located in a nearby kibbutz. It was there that the young Peretz developed his class-consciousness. He couldn’t help but notice the incredible gaps between Mizrahi Jews from the development towns and the Ashkenazi kibbutz members, who were wealthier, healthier, received better education and often patronized and bullied Mizrahi people from development towns, such as himself. When he was 18 years old, Peretz served as an ordnance officer in the paratroopers’ brigade, where he was badly wounded as a result of an accident. Peretz spent two painful years recuperating before buying a farm in the village of Nir Akiva, where he grew flowers and vegetables. It was during this period that he met his wife, Ahlama. Peretz became a Labor Party wunderkind when at 31 was elected mayor of the southern town Sderot, a Likud stronghold; he was elected to the Knesset five years later. He then won the election to head the Histadrut labor federation, which brought the outspoken Laborite with the memorable mustache to national prominence. He was hailed by pundits as a breakthrough figure – a left-wing Mizrahi leader from the country’s outskirts. But instead of jousting for position in Labor’s ranks, Peretz formed his own party in 1999, One Nation, which over two elections won only a handful of seats. In 2004 he returned to Labor, and the next year he scored an upset victory over Shimon Peres for the party leadership. But that 19-seat performance in 2006 put Labor 10 seats behind Ehud Olmert’s Kadima in the 120-seat Knesset. Labor joined the government and Peretz became Olmert’s defense minister, where he is credited for facing down skeptics and pushing for the development of the Iron Dome missile defense system – a critical decision considering the rockets that have rained down on Israel from Hezbollah in the north and Hamas and its allies in the south. Peretz saw his political stock rise and some of the political ridicule fall. Peretz, however, was defense minister during the 2006 Second Lebanon War, in which 121 Israeli soldiers were killed. Peretz left the defense ministry in 2007 and lost a Labor leadership primary to Ehud Barak, a former prime minister, defense minister and military chief of staff. Peretz would later jump ship for the second time. In 2012, he ditched Labor for Tzipi Livni’s Hatnuah party, which ended up joining Benjamin Netanyahu’s government, making Peretz environmental minister. He didn’t last long in a Netanyahu cabinet, however, resigning over a budget he said would bring children into poverty en masse and accusing the prime minister of running the country “like a monarchy.” But Peretz remained in Hatnuah, which ran with Labor in 2015 as the Zionist Union alliance. Later that year, in his fourth party switch, Peretz “came home” to Labor with the clear intention of taking another shot at the party leadership. Peretz’s history in the party has its pluses and minuses. He has long-time allies and a consistent message of socioeconomic justice and advocacy for peace with the Palestinians. But he also has critics and enemies — notably the woman who began her Labor career as his protégé but became his bitter rival, Shelly Yacimovich. And it’s questionable whether the party members he has abandoned and then returned to twice will give him a third chance. Finally, it doesn’t help that in Labor’s one national race under Peretz in 2006, the party could do no better than the 19 seats it captured in 2003. Allison K. Sommer and Asher Schechter contributed to this report.